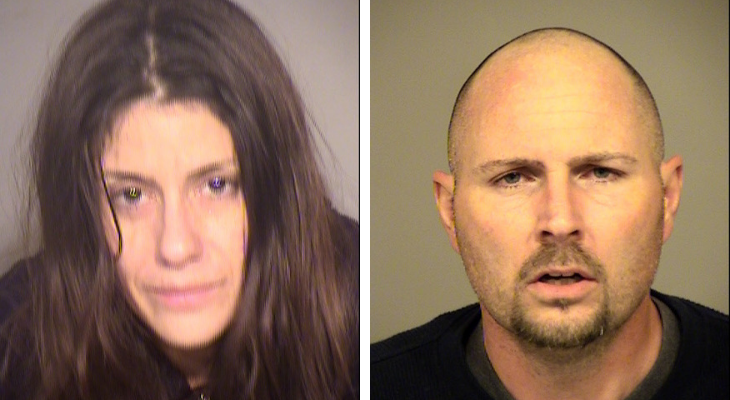 Two Santa Paula residents were arrested after being linked to a burglary that occurred to a Thomas Fire victim’s property. The victims were residents of the unincorporated area of Santa Paula. Unfortunately, their home was completely lost during the Thomas Fire in December of 2017, however, a detached garage remained standing. The victims used the garage to store personal property. Because of the loss of their home, the family was forced to move to a different location in the area. Throughout 2018, the victims returned to the location to check on the property. During the month of October 2018, the victims arrived at the property and noticed the garage had been broken into. The lock to a door was cut and several valuables were taken. Detectives received information that the stolen goods were sold at a business in the city of Ventura. Acting on this tip, investigators were able to identify Joshua Draper and Elise Main as the suspects. Detectives obtained a search warrant for Draper and Main’s residence. Investigators from the Sheriff’s Gang Unit and the Fillmore Detective Bureau served the warrant. The search of their property revealed additional evidence connecting the two to the burglary. As the investigation unfolded, detectives discovered that the suspects also had a storage locker in the city of Santa Paula. A search warrant was obtained for this location as well. The storage facility contained more stolen property from the Thomas Fire victims. Investigators also located several valuable construction tools and other property that appeared to be stolen but have not yet connected the property to a victim. The investigation is ongoing. Draper was booked for violating California Penal Code Sections 459 PC / Burglary, 496(a) / Possession of Stolen Property and for violating Health and Safety Code Sections 11550 (a) / Under the Influence of a Controlled Substance and 11364(a) / Possession of Drug Paraphernalia. Main was booked for California Penal Code Section 496(a) / Possession of Stolen property and Health and Safety Code Section 11550(a) / Under the Influence of a Controlled Substance. Both remain in custody with bail set at $300,000. No prison time for drugs, but plenty of charges for theft so off they go to prison. Hey CW. Stupidity always runs neck and neck with drug impairment. Who knows which bad they are? I never voted for that CW and your a native Californian so you claim to be are you including yourself in your conversation? Your logic doesn't make sense. I am so disgusted. I had to erase 5 drafts. Can't get much lower. Gotta buy those drugs! Let's hope they are made examples of by the judge. Total losers.